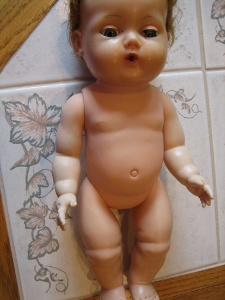 Vinyl was really the material that doll manufacturers were searching for since the inception of the doll industry. 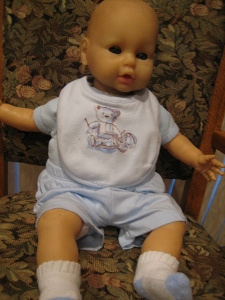 It was unbreakable, soft and pleasing to a child's touch, and inexpensive to manufacture. 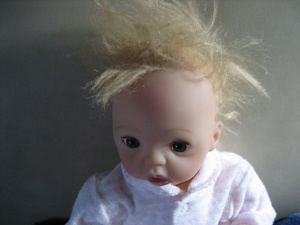 Also, vinyl dolls could have rooted hair instead of wigged, which greatly enhanced play value of dolls, making doll's hair sturdy and easy to comb and brush. According to the dictionary, vinyl is "any of various compounds containing the vinyl radical, typically highly reactive, easily polymerized, and used as basic materials for plastics." 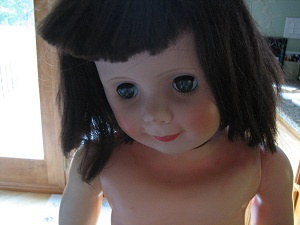 It was an innovation for its time and revolutionized many consumer products, including dolls. 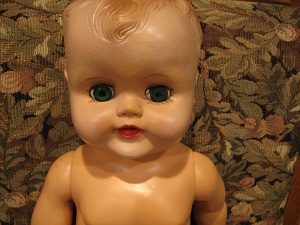 Vinyl dolls were first produced in the mid 1950s. 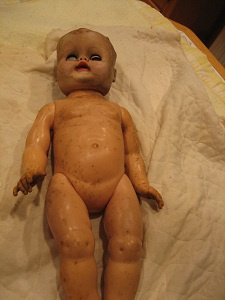 At that time, nearly all dolls were made of hard plastic. 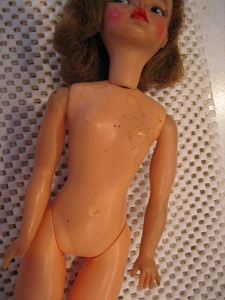 Hard plastic was an innovation in its own right because it was unbreakable, but the dolls were very hard to the touch, they still required wigs and they were also prone to splitting at the seams. 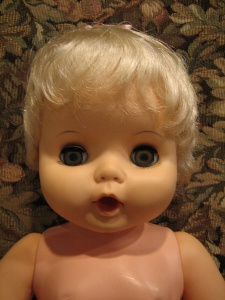 So, almost immediately, companies including Madame Alexander and Ideal made the jump to vinyl for nearly all play dolls. 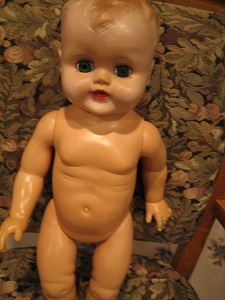 Vinyl is still the preferred material to make play dolls today. 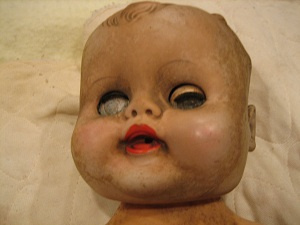 See how loving and playing with their favorite doll takes its toll...and how I perform miracle repairs! Did the owner try to style her hair? New hair and completely cleaned. Marks and mold plus a broken neck. Completely cleaned and fixed. 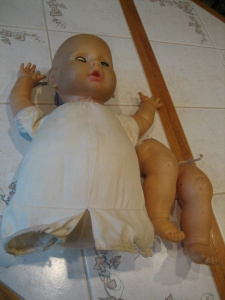 Dirty with detached legs. 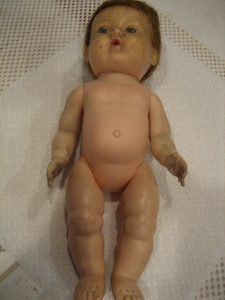 The same doll restored! 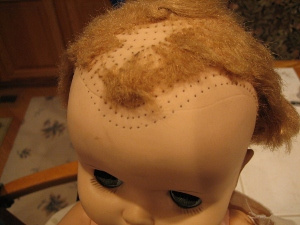 Torn out hair. New hair and cleaned up. Eyes are damaged. 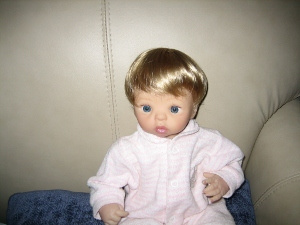 New eyes and a new doll. 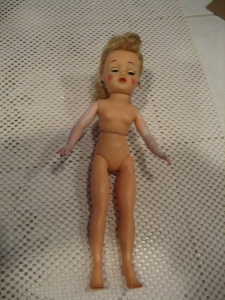 Entire doll needs cleaning. After cleaning and with new eyes. 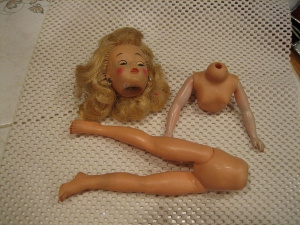 High fashion doll in pieces. Put back together again! Caved in chest. 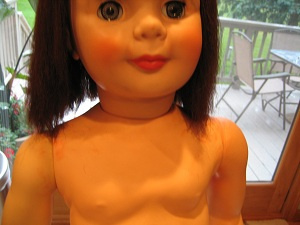 Chest repaired. 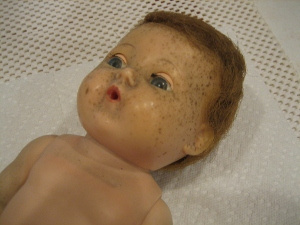 Tiny Tears has a very moldy face. Tiny Tears with a clean face. 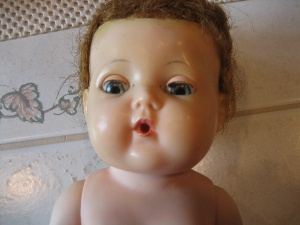 Tiny Tears with a moldy body. Tiny Tears with a clean body.